Our promotional company 2018 Diaries are great promotional gifts reminding your customers of your business details and company branding and logo. Hand them out to your customers and at trade shows, our Company Diaries allows individual entries, with a full yearly plan, world-wide maps, conversion tables, birthday planners, UK temperature, phone numbers and more! Our Company Personalised Pocket Diaries even include the London underground map. View our full range of Castelli Diaries here. This will open up a new window, so find the product you like the best and get back to us with the quantities. Were always here to help. Please just call 01989 565281. We are an independent diary supplier, so can supply great prices on any diary in the UK, such as a Castelli diary Castelli diaries Letts diary Letts diaries Collins diary Moments Diary. If you require a sample please contact us. Company Diaries are still one of the best Christmas Company Gifts. Even in these days of online technology Leather Diaries can be seen in offices around the country. 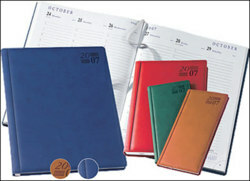 Many people have I-Pads and funky mobile phones, still keep a pocket diary in their handbag or suit pocket. We use a wall Calendar to look at a glance, use an I-phone when on the move, but all use the Week-to-view Desk Diary to book appointments, as a constant reminder and for planning each week.